Nevertheless, for all their purity, the presentation of the Quads was a little too specialized if not limited for my tastes. I gravitate towards speakers better able to handle the complexity, dynamic range and frequency extremes of a much wider variety of source material. And while I love a silky, spacious presentation because I listen to so much jazz, classic rock and symphonic music, I much prefer the emotion and immediacy of more [or less] traditional dynamic box designs. And there were any number of rooms where, in my estimation, those did a much better job of splitting the difference between silk and steel. Speaker designer Carl Marchisotto of Alon by Acarian was showcasing his Alon Lotus Elite Signatures ($7999/pr), which feature twin eight-inch drivers in their own separate, sealed chambers, with a dipole dome tweeter and a cast-frame, tri-laminate midrange with Alnico magnet mounted on an open baffle in a visually striking mirror image array. 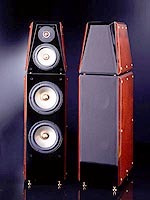 These three-way speakers were driven to perfection by some very sweet sounding, surprisingly dynamic deHavilland tube gear: The thirty-watt per channel Aries 845-G SET monoblocks ($5995/pr), and the 6SN7 equipped UltraVerve preamp ($2995), with some very fancy silver ribbon PranaWire cabling from their Cosmos line upping overall resolution into Olympian realms of the economically daunting and the musically sublime. What made this audition such a particularly homey experience for me was Carl's use of a digital front end comprised of the Sony SCD-777ES SACD driving an California Audio Labs Alpha 24/96 Tube DAC - which just so happens to have been my reference front-end source for a number of years until the Sony went bye-bye, thus affording me a familiar, dependable ground zero with which to speculate on what I was hearing. This genially extended system easily handled everything I threw at it, with exceptional snap, crackle and pop, remaining clear, coherent and dynamic even when pushed to higher volume levels, to effortlessly portray a warm, capacious soundstage in this crappy little hotel room. The Elite Signatures were just real easy to listen to and drive with these low-powered SET amps; silky, spacious and laid-back; oodles of ambient information, yet alive with full-bodied impact and midrange detail - an exceptionally musical speaker. Again, major props to the deHavilland amps for overall system synergy. Meanwhile, downstairs in one of the bigger suites, my good friends at Joseph Audio and Manley Labs once again charmed show attendees with a great sounding system and a restrained, devoutly musical presentation in which the performances were allowed to speak softly but clearly; with exceptional articulation, resolution and musical grandeur. They were aided and abetted in winning over Stereophile Best Sound at Show voters by Cardas Golden Reference Cabling, the incomparable Equi=Tech 1.5Q Balanced Power System, the SPJ La Luce CS Centoventi Turntable and digital front end gear from Orpheus Labs: The Zero CD Transport ($7000), and the Orpheus One DAC ($4800). This system showcased Joseph's top-of-the-line Pearl loudspeakers ($20,000/pr), while Manley's resounding 250 Neo-Classic monoblocks ($9500/pr) provided the requisite tetrode muscle to lift these power-happy loudspeakers out of Earth's gravitational field. The Manley Steelhead phono preamplifier ($7300) served double duty as the overall system preamp, and while its gain structure was not ideal, it proved more than equal to the task of conveying a high level of system synergy. Having had a private audition on Press Day, I returned a number of times to stand in the back of this packed room, taking in the system sound from a less advantageous perspective. Loud or soft, near or far, the Pearls portrayed music with the rich detail, epic transparency and endless soundstaging depth I've come to know and love in Joseph Audio loudspeakers. Like Wilson's Peter McGrath and BAT's Geoff Poor, Jeff Joseph's presentation put greater emphasis on music than gear, although he took it a step farther by emphasizing intimacy and involvement over sheer power and immediacy. During my Press Day audition, I was able to reference archival mono recordings of Robert Johnson's "Me And The Devil Blues" and Paul Robeson's "Sometimes I Feel Like A Motherless Child" from my DotCompilation demo CD. It was one of the most emotionally compelling experiences I had at the show - nothing at all analytical about it. I never felt as though I was observing some ancient technology's 'flaws' through an electron microscope. Instead, I enjoyed a palpable sense of spiritual beings in the here and now, forever young, their voices speaking directly to my heart, the music ablaze with the breath of life. I was also favorably impressed by the superb musicality, image specificity, center fill and sublime tonality of a superbly matched system that distributor Fred Nadel of Pure Audio had gathered around the $35,000 Mega line Loudspeakers from Dali of Denmark and a truly awesome set of double-decker amplifiers: The 70wps, pure Class A Ming-Da MC300B/845 monoblocks ($10,000/pr), which conferred an amazing degree of honeyed detail and sepia focus to the overall very pliant, alluring sound. I've never been much of an enthusiast of line-source/multi-driver arrays. It always seemed like a tweaky exercise in technological overkill, like using a cyclotron to swat flies; or undue complexity and point-source sound in what is essentially a two-way design. But in this case, I was swept away by Nadel's meticulous setup and the frequency extension, coherence and musicality of these big towers, which despite employing a trio of 2.5' ribbon tweeters and a dozen 6.5" woofers per side, performed a very convincing disappearing act. So much so that I came back at least once a day to knock back an aural cocktail or two and toss my best vocalists the Dalis' way (I loved how they simultaneously floated and anchored Paul Robeson's basso profundo descents). I invariably ran into Stereophile epicurean John Marks, who seemed positively smitten by the system. John in turn hipped me to some of his favorite vocal music, which served to showcase the system's surprisingly natural imaging and ease of presentation. Rarely have I heard a big system with such an intimate sound - like a great pair of mini-monitors on steroids. Despite the immensity of these speakers, everything was in scale, in focus and serenely laid back. And as the clock ticked down in my search for that elusive combo of silk and steel, I made my way to the Chesky suite for an all-too brief audition of the audiophile recording company's new C1 Reference Monitors ($4000/pr). 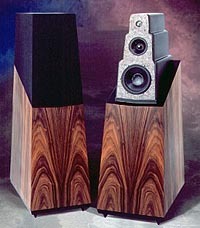 These elegant, mirror-imaged floor-standing two-ways featured the same superb SEAS Millennium tweeter as the Joseph Audio Pearls, with a pair of 6.5" bass-midrange drivers in an isobaric configuration. I didn't have time to do much listening, but the C1 Reference monitors projected a very warm, sweet, luscious quality with quick, focused bass and plenty of ambient information to spare, though clearly much credit for this room's exceptionally holographic sound must go to the MSB Technology Super DVD Audio player ($7999). Wish I had more time with that unit, as there was a plainly perceptible Mojo to every snippet of sound on my compilation CD. The MSB allowed me to hear so far inside the music that even after four days of intensive listening, I felt as though I was hearing a wealth of details and subtle acoustic cues for the very first time. Big fun. Finally, as I rushed about in the waning hours of the show, I found myself impressed anew by a pair of muscular, big-bodied, realistic sounding loudspeakers I'd enjoyed time and time again at past shows. Nevertheless, as musical and involving as these perennials from Gershman Acoustics and Vandersteen have always been, there's something to be said for the dedication of audio designers who are unwilling to rest on their laurels. The idea that loudspeakers as consistently satisfying as the Gershman Gap 520-X and the Vandersteen 5 could be improved in such a meaningful way is testament to the enduring love of music that fires the best folks in two-channel audio. Eli and Ofra Gershman have always built a great deal of value into their products, and their new Gershman Gap 828 ($13,000/$14,000/pr in black/burgundy lacquer) is no exception. This latest iteration of their totemic, small footprint tower benefits immensely from a new port for the bass sub-chassis, and a refined new crossover. The old Gap was always a very dynamic performer with resounding bass extension, visceral transient response, excellent soundstaging and a seductively layered midrange. 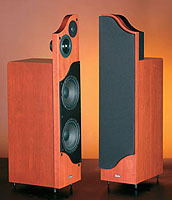 To some listeners, that midrange was too ripe and colored, while for others that 'coloration' was the glory, the very humanist element of the Gap 520-X. The new Gap 828 offers vastly improved low frequency speed and focus with greater top to bottom linearity and balance. Eli Gershman has managed to impart a more effortless quality to the low-frequencies, retaining much of the apparent lushness and midrange layering, but with a less bloomy, more transparent presentation and a smoother transition from driver to driver. And as far as my impressions of the new Vandersteen 5A ($14,500/pr) are concerned, well, I surrender dear. The old Vandersteen 5 always struck me as the exception that proved the rule as far as the design criteria went that distinguished Richard's popular, affordable Vandersteen Models 2 and 3 loudspeakers. With its resonance-free enclosure and integral self-powered subwoofer (room-tunable for both Q, frequency and amplitude), the Vandersteen 5 always proved more than equal to the anomalies of whatever funky, flawed rooms I heard it in at various Stereophile and CES shows over the years. 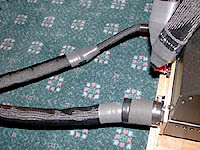 Inevitably, Richard Vandersteen and his most trusted dealers -- at the New York Shows it was true believer John Ruttan of Audio Connection in New Jersey -- always seemed able to do a frequency sweep of the room and tune the subwoofer module accordingly to dial out peaks and nulls, optimize soundstaging depth and make those speakers disappear. Yes, yes, yes, I know; first-order crossovers, time and phase coherence, hallelujah; but for this pilgrim, the proof has always been in the experience of music. And in San Francisco, Richard was in the tiniest, least felicitous acoustic space I'd ever heard his speakers in, teamed with Spectron electronics under the aegis of San Jose dealer Tailored Technology. 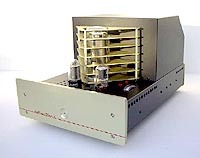 Tell you what, I'd be damn curious to check out the Spectron Musician II Amplifier ($3995) in my own home rig. Its class-D digital PWM switching technology is on the cutting edge of a new generation of amplification, and whatever aural anomalies I was supposed to experience never manifested themselves during my audition. This baby was putting out a more than respectable 500wpc of crisp, clean, pure power and never called attention to itself in any way, shape or waveform. And while the listening perch was way too close up and confined to optimize their performance and help the Vandersteen 5As disappear, for all intents and purposes, I disappeared in the presence of such a natural presentation. All of the soundstaging accuracy, frequency extension, midrange detail, trueness of timbre, transient timing and elemental warmth I'd enjoyed in demo after demo was manifest in the new Vandersteen 5A - but with significantly enhanced levels of sparkle, brilliance, transparency, clarity, speed and depth of field. Richard allowed as how the new Fives employ a more sophisticated tweeter, and also benefit from some subtle tweaking of the crossover network. John Ruttan of Audio Connection latter hipped me to the presence of a new switch-mode, regulated power supply for the subwoofer's integral 400-watt amplifier and some significant improvements to the cone and magnet assembly of Vandy's patented midrange driver. Irony of ironies, at a suggested retail price in the low five figures, the Vandersteen 5A and the Gershman Gap 828 have retroactively become high-end audio bargains, especially when compared to the big bucks some companies are asking for a lot less pleasure and performance. The only thing I don't like about the Gershman Gap 828s and Vandersteen 5As? They're not in my living room. Still, life goes on. See ya on the funway, pilgrims.